Emily Alley—Promoted to Director of Finance and Administration at Integrated Technology Group (ITG). This new role entails financial analysis, financial advising, and managing the budget at ITG. She is a native of Indiana and received her MBA at Trine University. Bianca Allison—Promoted to Senior Vice President at Bank of the James Mortgage. Allison joined the bank’s mortgage division in 2013 and was promoted to Vice President in 2015. Allison earned an AAS in Banking and Finance from Central Virginia Community College and is a graduate of Leadership Lynchburg. Susan Brown—New Program Director for the Downtown Lynchburg Association (DLA). This new position focuses on the planning and execution of DLA programs. 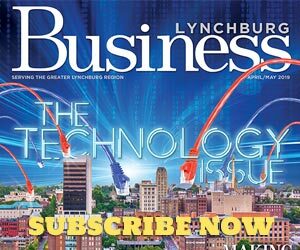 Brown has previous experience as the Assistant Market Manager for the Lynchburg Community Market and the Director of Special Events and Marketing with the Bedford Area Chamber of Commerce. Denise A. McDonald—New Executive Director of Old City Cemetery (OCC). McDonald comes to OCC from Lynchburg College where she worked for 18 years as Vice President of Advancement and Vice President of Major Gifts. She earned her B.A. from the College of William & Mary and is pursuing a Master of Nonprofit Leadership Studies degree at Lynchburg College. She is also a graduate of Harvard University’s Institute of Education Management. Maleah Mortoroff—Promoted to Compliance Engineer at Integrated Technology Group (ITG). This new role includes working with ITG clients who are subject to compliance regulations to determine their needs. She has been with ITG for about a year and is a Liberty University graduate. Reid Wodicka—Appointed as Deputy City Manager of the City of Lynchburg. Wodicka comes to the position from Bedford County where he was Deputy County Administrator. He received his bachelor’s and master’s degrees in Public Policy and Public Administration from James Madison University and a doctorate in Public Policy from the University of North Carolina at Charlotte.